Swivel launched recently, and was immediately dubbed by TechCrunch as the “YouTube for data.” The service allows people to upload datasets and then provides visualization tools. Very cool stuff. But this isn’t just a lightweight web-based Mathematica - they’ve included a slew of features aimed at connecting people through their data. I upload mine, you upload yours, and then we all can mash them together to see what happens. This has immediately given rise to many fine examples of the fallacy of causation and correlation. The graph below, for example, graphs Apple Computer’s daily stock price against the temperature in Cupertino indicating that you should most certainly sell when the weather heats up in the Bay Area. 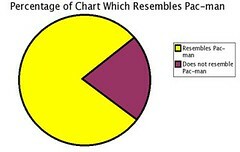 And finally, there’s the infamous Pac Man pie chart that recently re-emerged on BoingBoing. Data visualization can be funny.